The word "value" has many different meanings. It can be used as a noun to mean 1.) relative worth, merit, or importance, or 2.) as a verb to articulate how one considers (something or someone) with respect to worth, excellence, usefulness, or importance. Or the term value can mean 3.) a fair return or equivalent in goods, services, or money for something exchanged; "value" for the price. This blog is usually where I address the many reasons I value, definitions 1 & 2, living in the Adirondacks. Today however, I'll discuss the fact that there are a multitude of values, definition #3, in Adirondack property available at this time. For the first time in a number of years, the inventory of Adirondack property is relatively high. Prices are down a bit, not as much as the rest of the country, but there have been some price reductions. A case in point is a listing I have at One Main Street in Lake Placid. The building sits in a premier, first-rate corner location on Main Street, with a backyard on pristine Mirror Lake. Originally listed at $1.4 million, the owner who is ready for retirement, recently lowered the price to $950,000. 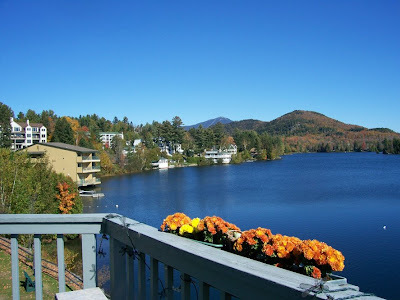 That is a good, fair price for a commercial building that borders the Village Park, enjoys incredible foot traffic, a great rental income history and features lake front commercial property in the immensely popular resort Village of Lake Placid. I now have a great deal of interest in the property because it is value priced; a good, fair deal. Obviously, the value of the property, and anything for that matter, is directly related to the attributes the buyer needs or desires. If you are looking for a great location for a business that gets a ton of foot traffic and has magnificent lake frontage (eye candy), then this is would be a value purchase for you. If you just need a building in which to store equipment, not so much. Another important point in this discussion is timing. Like everything in life, feeling good about the purchase of property can frequently be attributed to timing. If you just purchased an Adirondack property, you might be thinking right about now, "Boy, am I glad I bought this now. It was a real value." According to everything I am reading and seeing, if you are thinking about real estate in the Adirondacks and want to feel like you got a value, you should buy very soon. I'll pass on a Triple S investing tip I received recently in the form of a video clip. The clip features a very confident Jim Cramer calling a buy on real estate. Despite the recent criticisms, you'd have to admit he is pretty smart and rather entertaining. If you agree, you might enjoy listening to his recent observations on the real estate market. If you are interested in learning more about value in the Adirondack real estate market, give me a call.